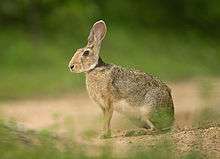 There are 7 recognized subspecies of Indian hare. ↑ Hoffman, R.S. ; Smith, A.T. (2005). "Order Lagomorpha". In Wilson, D.E. ; Reeder, D.M. Mammal Species of the World: A Taxonomic and Geographic Reference (3rd ed.). Johns Hopkins University Press. p. 201. ISBN 978-0-8018-8221-0. OCLC 62265494. ↑ Lagomorph Specialist Group (1996). "Lepus nigricollis". IUCN Red List of Threatened Species. 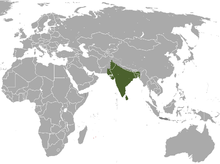 Version 2006. International Union for Conservation of Nature. Retrieved 2006-12-27. ↑ Suchentrunk, F & Mihajla Davidovic (2004). "Evaluation of the classification of Indian hares (Lepus nigricollis) into the genus Indolagus Gureev, 1953 (Leporidae, Lagomorpha)" (PDF). Mamm. biol. 69 (1): 46–57. doi:10.1078/1616-5047-115.